Have you ever wondered if you’re missing out on portfolio returns? Do you wonder how a hedge fund manager might manage your money? Here at DIY.Fund, we put hedge fund quality tools into your hands, so you can manage your portfolio like a professional. We want you to maximize your returns given your tolerance for risk, and to create a portfolio that falls on the efficient frontier. Portfolios on the efficient frontier properly manage risk and reward. The efficient frontier shows the maximum returns you can expect given your risk tolerance. Our tools are designed to keep you on the frontier by helping you manage your risk. In this article, we explain five risk ratios that will help you manage risk and returns in your portfolio. Our benchmark is the S&P 500 index. Portfolio 1 contains 10% International Stock, 40% Domestic Stock and 50% Bonds. 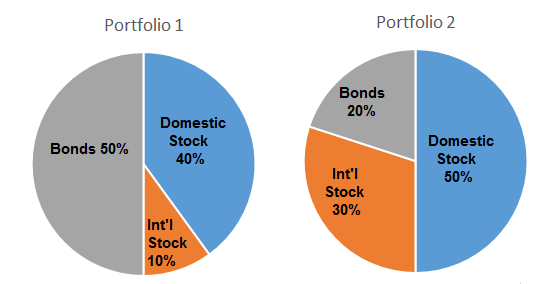 Portfolio 2 contains 30% International Stock, 50% Domestic Stock, 20% Bonds. Alpha measures portfolio returns relative to a benchmark’s returns. It is a meaningful calculation if your portfolio is diverse enough to eliminate non-market risk. A positive Alpha indicates better returns than the benchmark. Many investors “chase Alpha”, but most do not outperform their benchmark in the long run. Remember, Alpha is just one of five risk ratios you need to understand. Most investors use the S&P 500 or Government Bonds as their benchmark. However, depending on your asset allocation, those may not be appropriate benchmarks for your portfolio. Fund managers may use one of thousands of benchmarks to calculate Alpha. As the manager of your own portfolio, its up to you to determine the best benchmark for your portfolio. In our example, these were the returns (CAGR) that each portfolio achieved during the specified time frame. Portfolio 1 under-performed relative to the benchmark, and Portfolio 2 over-performed relative to the benchmark. However, Alpha is not the only risk ratio that matters. Beta measures the volatility (risk) in a portfolio compared to the volatility of the benchmark. If your portfolio is less volatile than the market, your beta will be between zero and one. Conversely, if your portfolio is more volatile than the market, your beta will be greater than one. The lower your beta, the less risky your portfolio. Covariance measures how closely your portfolio and your benchmark move together. We calculated Beta using the annual returns on a percentage basis (as seen below). Portfolio 1 demonstrated significantly less risk than the benchmark while Portfolio 2 was slightly less risky than the benchmark. In both portfolios, diverse asset allocation led to decreased risk relative to the benchmark. 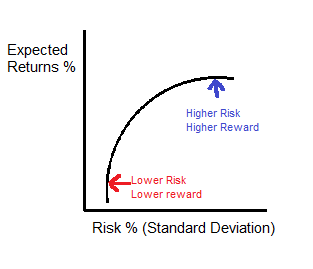 Another way to understand risk is to calculate your portfolio’s standard deviation. Standard deviation measures how much your portfolio varies from long run performance in any given year. Standard deviation can be visualized as distribution of returns. A fatter chart indicates a more volatility while a narrower chart indicates less volatility. More risk-averse investors will seek a lower standard deviation. 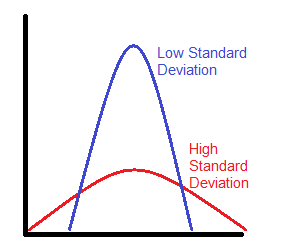 Standard deviation measures the variation between mean performance and performance in a given year. Our Benchmark had the most deviation (risk), and Portfolio 1 had the least. By itself, standard deviation does not tell us much about the portfolio’s risk profile, but Standard Deviation is a critical component of the next risk ratio. The Sharpe Ratio measures risk adjusted return. When one portfolio experiences higher returns than another, the Sharpe Ratio can help you determine if the returns are due to smart investing or excess risk. The Sharpe Ratio can also help you evaluate how changing asset allocation will change change your expected risk adjusted returns. For this example, we will use a risk free rate of return of 3% which is close to the average yield of a long term US Treasury Bill. 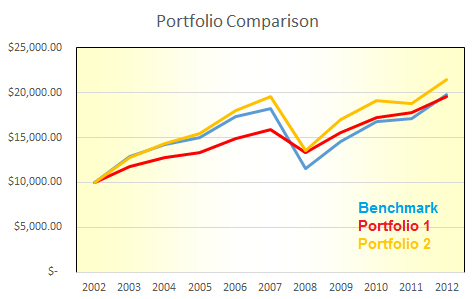 On a risk adjusted basis, both Portfolio 1 and Portfolio 2 outperformed the benchmark. However, it is important to note that Portfolio 1 significantly outperformed Portfolio 2 and the Benchmark on a risk adjusted basis. As an investor, you can use the Sharpe Ratio to determine if the extra point of performance in Portfolio 2 is worth taking on 25% more risk as compared to Portfolio 1. R-Squared represents how much of your portfolio’s movement can be explained by movement in the benchmark. If you have an R-Squared of 100, then 100% of your portfolio’s movement is explained by movement in the benchmark. A portfolio with an R-Squared of more than 85 is said to be following the market. Some investors prefer to match the market. These investors seek a high R-Squared. Other investors want to diversify themselves from market risk, and they seek a low R-Squared value. R-Squared measures how much of a portfolio’s movement can be explained by the benchmark’s movement. We calculated an R-Squared value of 78 for Portfolio 1. This means 78% of the movement in the portfolio was explained by changes in the benchmark. With an R-Squared of 93, Portfolio 2 followed the benchmark very closely, and some investors may use this information to help them reconsider their asset allocation strategy. Why learn about risk ratios? Portfolio management is all about balancing returns and risk. At the beginning of this exercise, it looked like Portfolio 2 (which achieved a positive Alpha), was the best portfolio. However, it is impossible to manage your portfolio well when only looking at the returns. As we walked through the remaining risk ratios, we learned that on a risk adjusted basis, Portfolio 1 outperformed both Portfolio 2 and the benchmark. It is critical to understand the balance between risk and returns (especially risk adjusted returns) to properly manage your portfolio. The more knowledge you have about your portfolio, the better you will be able to stick with your strategy, even in volatile markets. Nobody cares about your portfolio’s performance as much as you do, and we hope that this introduction to risk ratios will help you manage your portfolio like a professional.